Pickup trucks can be very handy for moving large or long items that will not fit in a car or SUV. Therefore, those who have a pickup might be asked to move things for people who do not. It is important to properly secure any large items in the bed of the truck because those who do not can be sued for negligence should the objects come loose and cause damage to personal property or bodily injury. 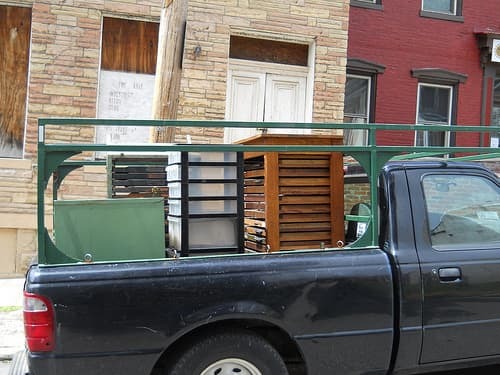 If the items are relatively heavy and have a low profile, it might not be necessary to strap them into the truck bed if the tailgate is left secured. Items that rise above the walls of the bed will probably need to be strapped or tied down to keep others safe. Many trucks beds have options for tying down items. These can be great places to deploy ratchet straps or bungee cords. Additionally, ropes and cords that are not electrical can be utilized for tying down objects. Tall items like refrigerators can be quite difficult to transport. Placing such an item near the cab of a truck is usually the best bet, because they can be steadied to some degree by the cab. It is best to secure these large items over the top and around the object. The straps should be relatively high on the body of a refrigerator to make it less likely to tip over. Shorter items like washers, dryers or stoves should also be transported in a similar fashion. They should be strapped down as securely as possible and transported near the cab. Of course, each strap should be securely fastened to the bed of the truck. Long items that will not stand up should be transported with the tailgate down. The tailgate is not designed to support heavy weight. These items that could include pipes or boards should be tied together and then secured to the bed of the truck with straps or bungee cords. Placing a strap around the end of the boards that faces the open tailgate will provide additional stability. Very light items should have a tarp or other covering to avoid having them fly out of the bed of the truck. These tips will help keep the likelihood of damage down. Regardless of how well a load is secured, it is also important to remember to avoid making sharp turns very quickly as the load can shift and cause massive problems.